President Obama recently released his fiscal year 2016 budget proposal. 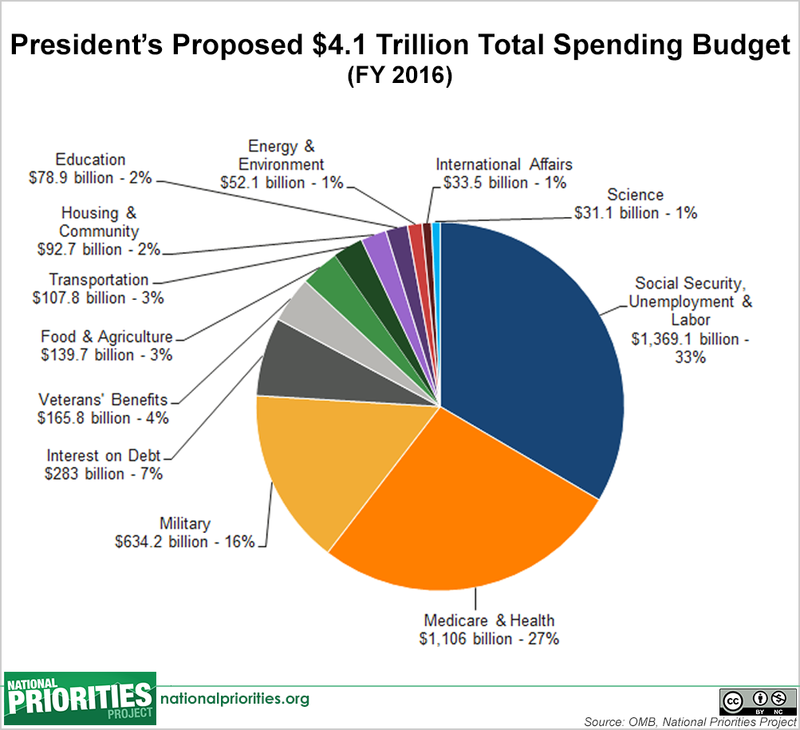 Budgets are about our nation’s priorities: What are we going to spend money on? How are we going to raise the money we want to spend? Though the budget ultimately enacted by Congress may look very different from the budget request released by the president, the president’s budget is important. It’s the president’s vision for the country in fiscal year 2016 and beyond, and it reflects input and spending requests from every federal agency. These pictures tell the story of the priorities found in the president’s budget. 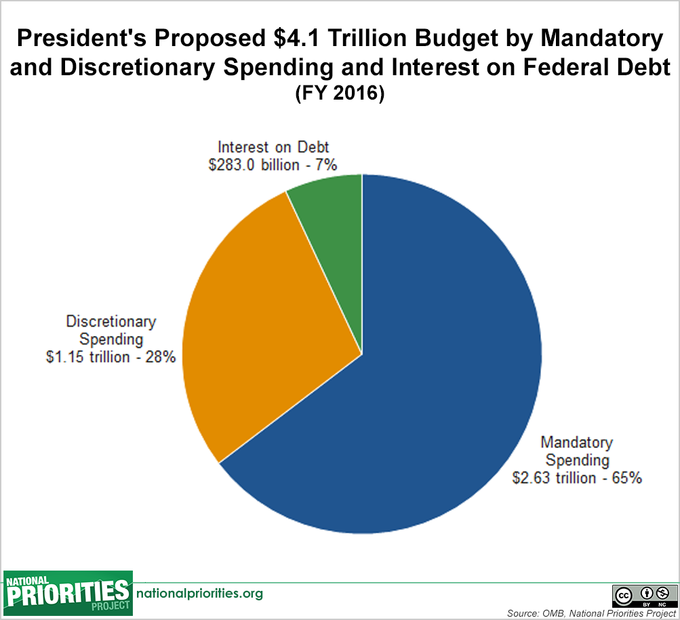 This chart shows how President Obama proposed allocating $4.1 trillion* in total federal spending in fiscal year 2016, an increase of more than 5 percent over the total 2015 spending level. 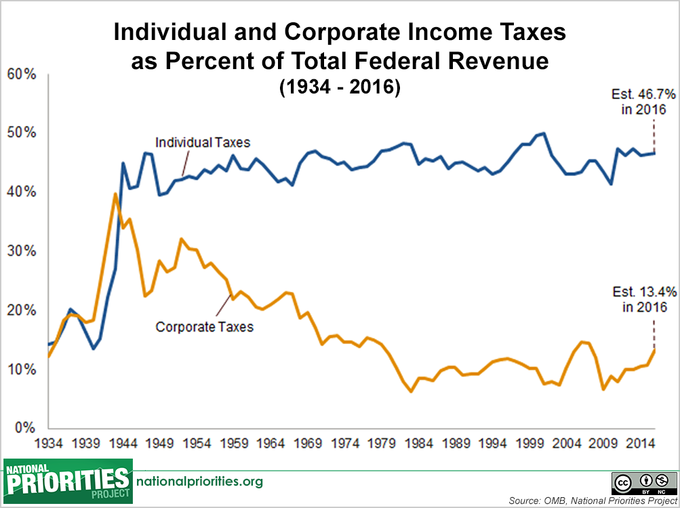 This includes every type of federal spending, from funding for discretionary programs like infrastructure improvements and job training to mandatory spending programs like Social Security and Medicare, as well as interest payments on the federal debt. Social Security and labor, Medicare and health programs, and military spending will make up 76 percent of the total budget, leaving just 24 percent, or $957 billion of the $4.1 trillion total, to spend on all other programs. 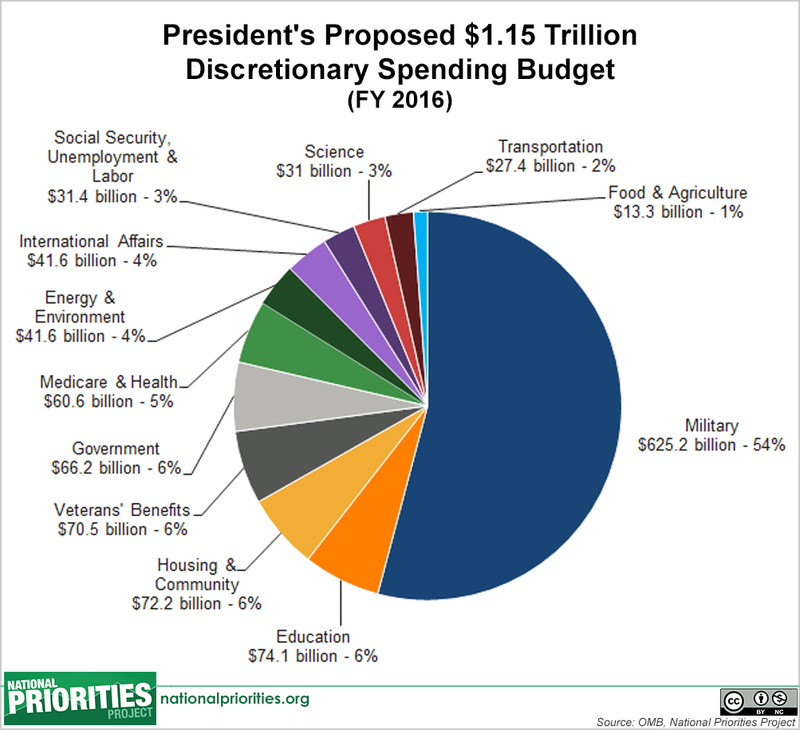 * Spending on Government (administration) is less than zero and omitted in the total spending pie chart. Lower than zero spending can occur when segments of government have surpluses from previous years that they return to the federal government. This chart shows how funding for military and non-military discretionary programs has changed over time. 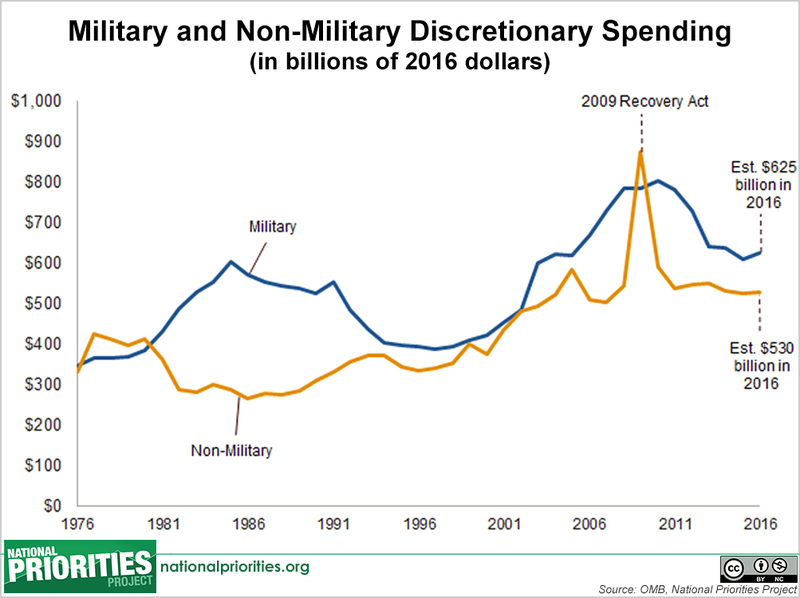 Under the president’s fiscal year 2016 discretionary budget, military spending would account for 54 percent, while non-military spending would account for 46 percent. 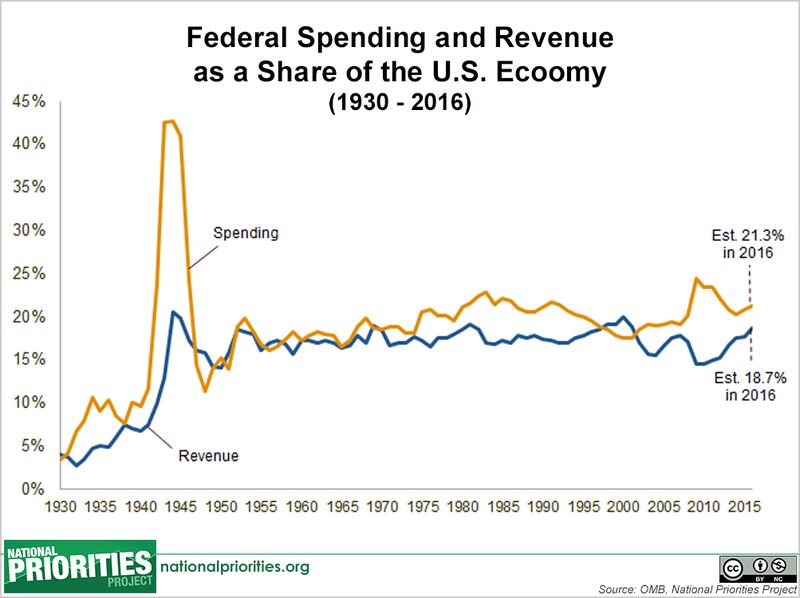 This chart shows federal spending and tax revenue as a share of the overall U.S. economy (measured by Gross Domestic Product, or GDP) dating back to 1930. 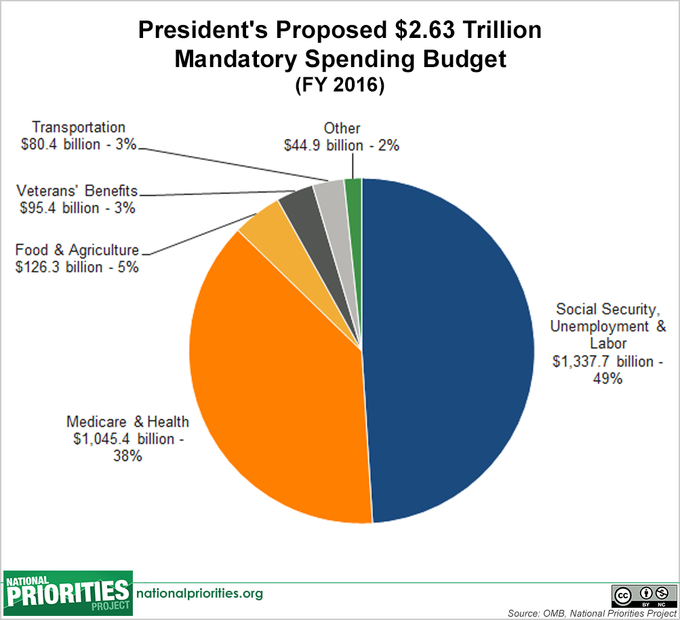 In fiscal year 2016, the president’s budget proposes federal spending levels totaling 21.3 percent of the U.S. economy and revenues as 18.7 percent. In 2016, the president proposes collecting $3.5 trillion in total tax revenue, with individual income taxes and payroll taxes – which fund Social Security and Medicare – as the largest source of revenues. 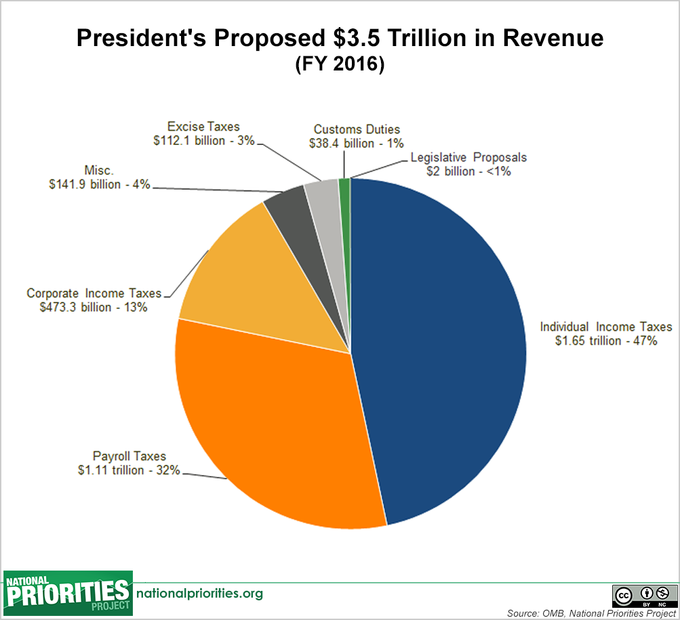 President Obama proposes a budget where tax revenue will cover nearly 87 percent of total spending. The rest – 13 percent – will come from borrowing. 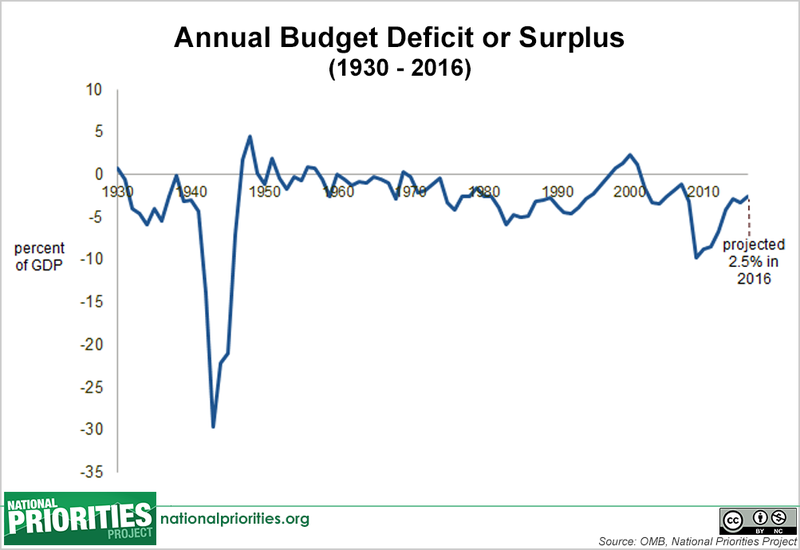 This chart shows the size of the federal budget deficit (or surplus) as a share of the overall U.S. economy (measured by Gross Domestic Product, or GDP) dating back to 1930. In President Obama’s fiscal year 2016 budget, the deficit amounts to 2.5 percent of the economy. That’s on par with annual deficits since World War II. For additional analysis of the President’s fiscal 2016 budget, see NPP’s President Obama Proposes 2016 Budget.